Increased air resistance due to the plugging of the coil surface. What causes this plugging? There is an increase of dirt and airborne material that lodges deep inside the coil core that cannot be removed with a normal air side cleaning process. Improper filter replacement and lack of annual coil cleaning creates this situation. A plugged coil causes a decrease in the overall heat transfer due to the insulating effect of the material inside the coil core and the subsequent reduced air flow. Major damage from a freeze event. 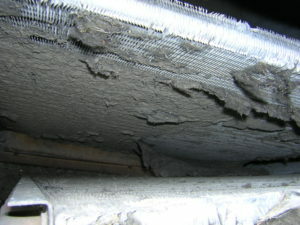 Why is there freeze damage when most cooling coils are dormant during the winter heating season? Many coil manufacturers have built circuitry into the coil design that won’t allow for full drainage. The drain locations are often placed above some of the tubes and circuits that are required to fully drain the coil. If a coil has extensive freeze damage, then it’s virtually impossible to locate all the leaks. Even if you find the initial leaks, the tubes have been compromised and can cause further failures in the future. This is due to the thinning of the wall from the increased pressure created by the freeze event. Corrosion. A salt laden atmosphere can cause external corrosion where the tubes and fins meet. Visually this will look like a white ring around each tube in the coil. This means you are losing tube and fin contact, reducing performance. Also, the coil will fill its core with the white corrosive byproduct thus drastically reducing air flow. There are many other forms of corrosion, both air side and in the tubes on the water/refrigerant side. One form of importance on the water side is raw, untreated water that contains minerals and byproducts that may corrode copper. Another form of corrosion on the air side is the hydrogen sulfides produced in sewer treatment plant applications. It’s very important to note that a competent coil specialist should review the problems that led to the premature coil replacement; and possibly, redesign a coil that will increase longevity. There are also modifications that can be made to increase capacity, lower air and fluid pressure drops, and provide a much better coil design. Cooling coils are replaced all the time, and about 95% of them have never attained their full life expectancy. It’s important to understand why this happens. It’s just as important to not replace a problem with another problem.